They have been in coma lately but, through 53 years of history, Sony has created some of the most amazing gadget in history. Some of them changed the world forever. Here you have them all. Click on the image above to access the full timeline in 2800 x 1188 pixels. I look back in time and I can't help but wonder what the hell is wrong with Sony. Sure, they have had they share of disasters, like Betamax, but overall they always were a company breaking new ground and opening new product categories. 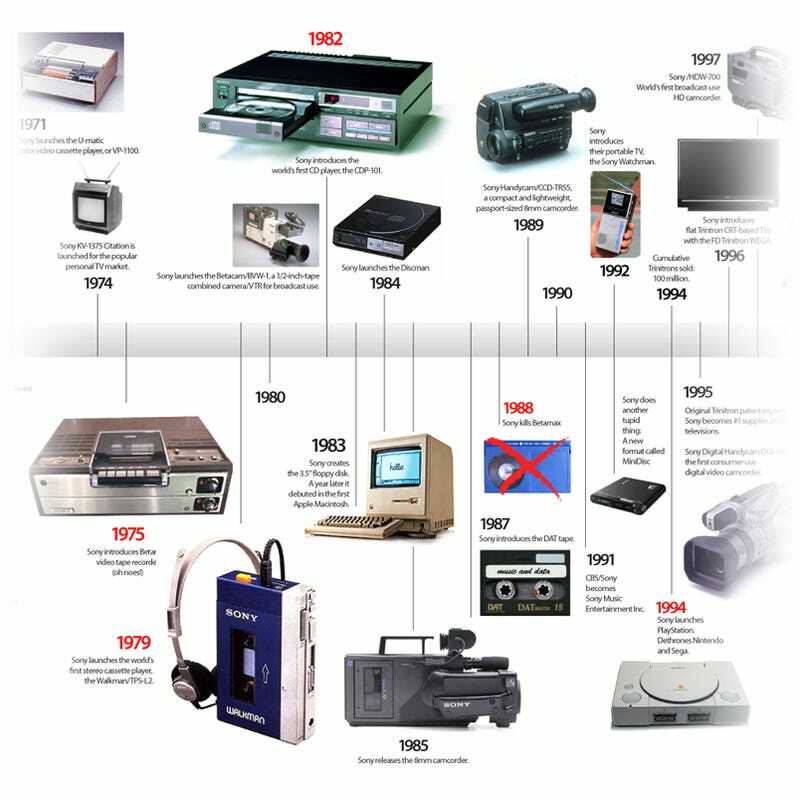 Some of their products, like the Sony Trinitron or the Sony Walkman, changed the way we understood TV and music. Their professional U-Matic and Beta video series did the same, democratizing movie and video production. The Playstation introduced 3D graphics in the gaming world in a big way, destroying the status quo, which at the time had Nintendo as its king. Even their transistor radios were groundbreaking, not to talk about their stunning designs in the past. Today, their product designs are bland. And their technology, except for a few exceptions that have their replica from other manufacturers, is just me-too. No spark, no true revolutionary innovation. Just a giant, surviving in a world where other brands now carry the torch they had for decades. Click to viewLook at the timeline and marvel at all the "world's firsts" these people had. I'm sure you will have the same feeling.